Whether it's the studio or the stage the D'addario American Series is a Great Choice. American Stage cables are precision engineered and built to ensure that your tone comes through the mix with the utmost transparency. 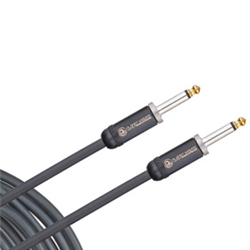 Planet Waves uses audiophile-quality wire that's made in the USA featuring low 28pf/ft capacitancem, 95% shieldingand and designed to reproduce the natural tones of your instrument with no interference. The plugs are made by Neutrik in their state-of-the-art facility in Lichtenstein in accordance with Planet Waves' patented specs. The exclusive Planet Waves In-Line solder process creates a permanent bond between wire and plug, making a clear connection with incredible strength and durability. Using only the finest materials, custom designs and precision USA manufacturing methods, American Stage delivers a professional performance cable. The result is pure, natural tone. Start Playing with Planet Waves, studio stage or practice they wont let you down..